Travel is always a great way to gain inspiration for your home decor, and, along with Iceland, Scandinavia is high on my wanderlust wish list of places to explore. So when Destinology recently asked me to take part in their Inspired Spaces campaign by creating a destination inspired look in my home, it was fairly logical that I might choose something of a Nordic theme. Additionally, at the start of this year, I wrote about the Danish concept of ‘Hygge’. 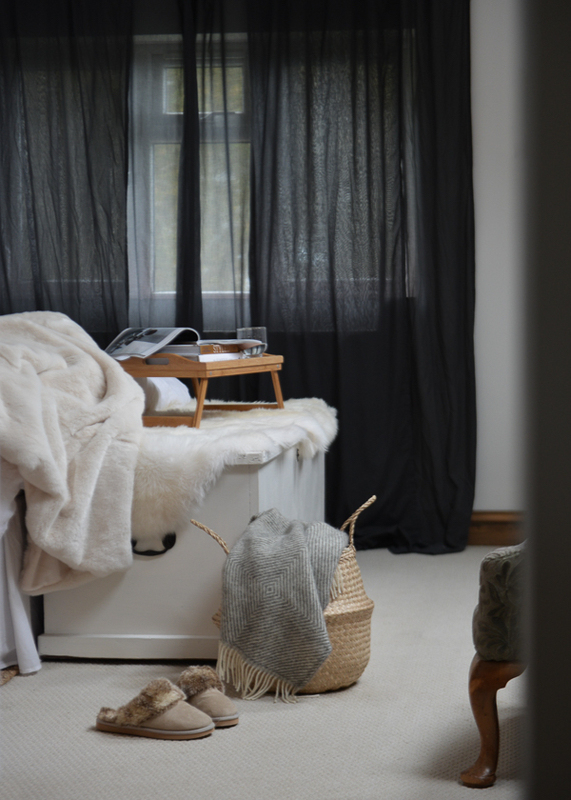 It’s not just theory for Winter, and it’s an idea that I’ve kept in mind right throughout the year, but it’s certainly easier to think about creating really cosy spaces during the cooler seasons. With recent changes in my life, having my own sanctuary and a little more time for ‘Hyggelig’ has also been an important factor for me, and one that guided me in updating my chosen room. I’ve always found my bedroom to be a calm space and I tend to be drawn there on the Sunday afternoons I have to myself. I can’t do any major changes at the moment (much as I’d like), so it’s been simply about layering additional textures. 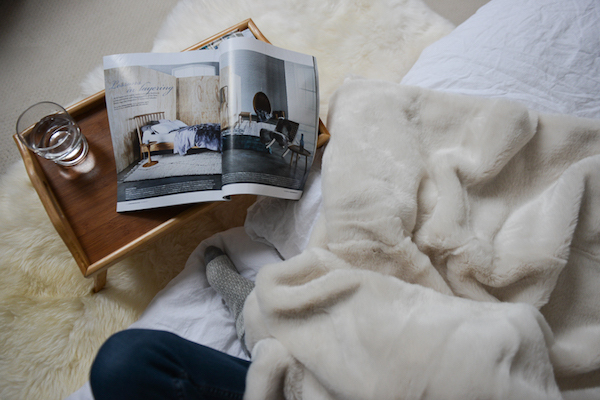 To my mind, there’s little cosier (& more Nordic inspired) than sheepskins, fur throws, & 100% wool blankets. I always think these look so great combined with simple linens. I’ve also switched out my curtains to layers of deep grey: they’re still quite sheer, so light filters through, but by layering them, it creates an additional sense of texture & depth. 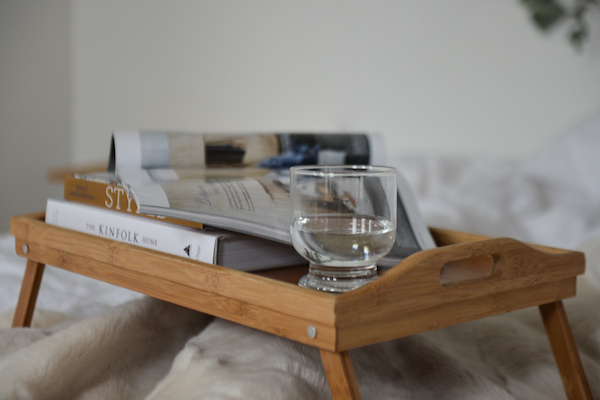 I’ve enjoyed spending time just resting and reading (have you peeked at The Kinfolk Home yet? – swoon! ), and as the evenings draw in, I’ve taken simple pleasure in lighting scented candles whilst curling up with stories & Netflix on my iPad (I’ve only recently discovered Netflix – total series addict now!) It’s the perfect cosy inspired space for me to retreat, reflect & dream of Nordic winter escapes. Do you get inspired by your travels (or wanderlust)? I’d love to know what destination would inspire your space right now? Disclosure: This post is written in collaboration with Destinology & ZaraHome as part of the Inspired Spaces campaign. Content, images & opinion are my own. Soo wonderfully cosy. I recently switched our living room curtains to charcoal grey and I absolutely love them. I was worried they’d be too dark to begin with, but they add such a lovely feeling of depth and cosiness to the room.